Ho-Ho-Ho! 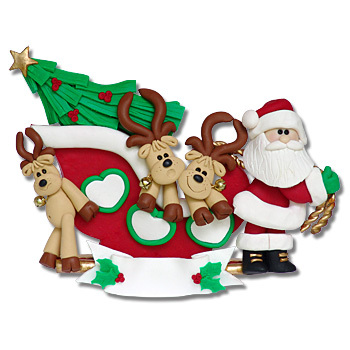 The reindeer have paid their dues and now it’s Santa's turn to pull the sleigh. This personalized ornament is great for grandparents, single parents, and of course a family of 3. May be personalized with 3 names on the hearts and a message on the banner such as "Grandma's Dears". Handmade from polymer clay and designed by Debi Allison. Ornament comes complete with hooks and satin ribbon for hanging.